When Paul Armin Edelmann and Siphiwe McKenzie appear as sweethearts in San Diego Opera's production of Mozart's "The Magic Flute," watch for the sparks to fly. The real-life couple has a special connection to the San Diego Opera stage -- it's where they first met and fell in love. The couple, now engaged, was introduced last year during San Diego Opera's production of "Die Fledermaus," in which Canadian soprano McKenzie played Adele and Austrian baritone Edelmann played Dr. Falke. During the five weeks the company spent together, Edelmann and McKenzie saw each other every day, and found a connection that ran deeper than the professional. "He asked me how I was doing and I said, 'Do you have four hours?' And he said, 'Yes, I have four hours, and more,'" said McKenzie. "We connected on that level -- the human level, not the business level." Both were familiar with the challenges of being in a relationship with another singer -- the conflicting schedules and time apart, the egos, the intense focus on career. They didn't know whether it would last. But they followed their hearts anyway. "I think when you believe in something, things work," said Edelmann. "When you meet the right person in life, it's something you cannot explain, you just have the feeling ... I followed that feeling, and I was at first always surprised (at how things worked out), but now I'm not surprised anymore." They believed, and "opportunities -- like gifts -- have fallen from the sky," McKenzie said. Opera house directors began casting the couple as a package deal -- they have four contracts to work together this season. 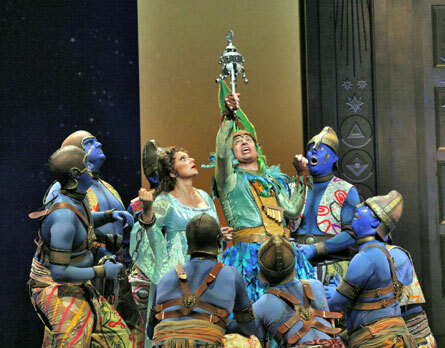 San Diego Opera general director Ian Campbell called to book them in "The Magic Flute" as Papageno, the bird-catcher, and Papagena, the bird wife he ensnares. Sometimes life imitates art. In Mozart's fairy-tale opera, Prince Tamino (German tenor Rainer Trost) is sent on a quest to rescue and win the love of the beautiful Pamina (German soprano Ute Selbig) from the high priest Sarastro (Polish bass Daniel Borowski). Tamino, given a magic flute by the Queen of the Night (American soprano Cheryl Evans), and accompanied by Papageno, enters the realm of Sarastro, who challenges them to a series of trials to prove their worth. The opera ends happily, of course. 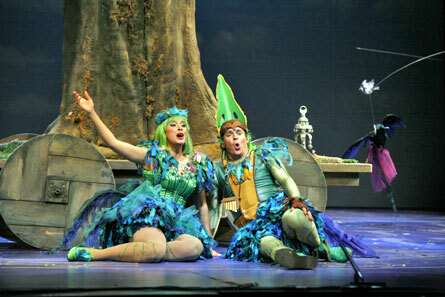 Tamino and Pamina are united, and Papageno finds his Papagena. The opera premiered in 1791 and was an instant success. It has been popular ever since. 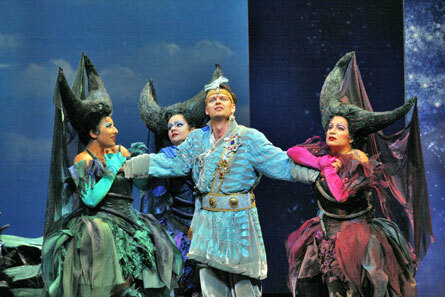 While Mozart's previous operas had been written for court theaters and aristocrats, "The Magic Flute" was written for a commercial theater and the common people. Its unique combination of the sublime and the ridiculous, and its wild mix of farce, magic, symbolism, fairy-tale adventure and Masonic lore captivate both child and adult, novice and connoisseur. This production is a remounting of San Diego Opera's sold-out 2001 performance, and once again features costumes by famed pink-haired fashion designer Zandra Rhodes. Michael Hampe, one of Germany's finest stage directors, returns to direct. "The story wouldn't have stayed in the repertoire without the music of Mozart. It has a magic which cannot be explained," said Edelmann. "It's unbelievable what he expresses in the music; I never get tired of it." That's important, since the local production marks Edelmann's 14th appearance as Papageno, which has become his signature role. The plumed bird-catcher is the character the audience most relates to, said Edelmann. "Papageno is a very human character. He has happiness, love for life, he loves to eat and drink, but he's not necessarily what singers try to do -- he's not a clown," Edelmann said. "I take him very seriously. He may be funny in some situations; he's colorful. But first you have to act him as very human, with a big heart, and also the weaknesses of human beings. "If you do it right, you touch the heart of people more than you necessarily make them laugh. When you think he has to be funny, you've failed the goal of the character," he said. Though Papagena's part is much smaller, McKenzie said she is having fun with the cheeky, mischievous role. The two lovebirds also perform the most charming duet of Mozart's opera. But mostly, McKenzie is happy to share the stage with her fiance. "It's such a pleasure, such a joy," she said. "I love that we get to do it together." The singers, brought together by faith in their love, bring the same passion and commitment to their singing. "So many singers think it's about technique, technique, technique," said McKenzie. "We're both all about heart. It's dangerous to sing like that, but if you feel the music, you feel the coloratura, the breath, the phrasing from the heart ... and you believe in (your heart) in what you're saying, in what you're singing, that's the best way. It's the only way. It's our way." "In the best possible case, you open your soul, you give your soul, you sing and give out that energy, and get the energy back," added Edelmann. "It's not about performing, it's about soul." Dates and show times: May 6 and 9 at 7 p.m., May 12 at 8 p.m., May 14 at 2 p.m., May 17 at 7 p.m.